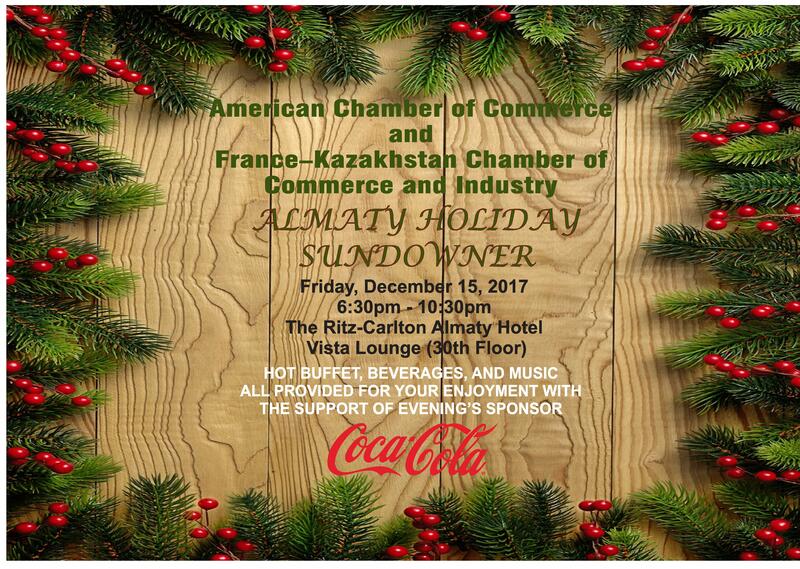 AmCham invites you to attend a very special Winter Holiday Sundowner jointly organized with the France-Kazakhstan Chamber of Commerce and Industry (CCIFK) at the Ritz-Carlton Hotel on Friday evening, 15 December before many of our members depart for the winter holidays at home or abroad. Members and guests will enjoy the nighttime panoramic view from the Hotel's 30th floor while listening to seasonal music, sipping a glass of wine, and enjoying an elegant buffet dinner sponsored by Coca-Cola. Registration in advance is required through the AmCham office info@amcham.kz until 5pm, Thursday, 14 December. The Registration Desk at the Ritz-Carlton opens at 6 pm, December 15. Please see attached flyer for details. We look forward to welcoming you to the AmCham-CCIFK Winter Holiday Sundowner on Friday evening, 15 December.